When planning our itinerary for backpacking Southeast Asia, Laos was high on our list of countries to visit thanks to its reputation as a nature lover’s paradise. It did not disappoint! Our month in Laos flew by, and we are already considering a return visit. In this Laos backpacking guide, I’ll share the best places to visit in Laos (and which ones to avoid)! Laos is a country full of variety and beauty. Whether you love to trek through mountainous jungles, explore ornate historic temples, or simply watch the sunset from a hammock, you will find what you are looking for because there are so many amazing things to do in Laos! Laos sees fewer tourists than it’s surrounding neighbors, which makes it a less crowded, more peaceful travel destination than many other Southeast Asian countries. Stunning natural beauty and a rich, well preserved local culture make Laos one of the most unique countries to visit in Southeast Asia. Laos food is delicious! Laos cuisine is deeply under appreciated, while the neighboring countries of Thailand and Vietnam seem to get all the culinary credit. Later in this guide I’ll cover the Laotian dishes you MUST try on your visit. Getting around Laos: Bus, boat, or plane? Getting from point A to point B in Laos is an adventure in itself. Before we entered Laos I did a lot of research on transportation options. Based on that research and our own experiences I would recommend using boat and plane travel as much as possible in Laos. The buses and vans in Laos are VERY hit or miss. We took one bus ride that felt relatively safe, although the bus had no air conditioning and people were siting in the aisles. However, taking the same route the opposite direction we found ourselves packed into a “minibus” (really just a glorified van) with a driver that drove like an absolute maniac for 3 hours. After talking with other travelers in Luang Prabang we learned that insane bus rides were the norm throughout Laos, and that was when we decided to take boats and planes as much as possible. This slow boat experience is a must if you are traveling from northern Thailand into Laos. 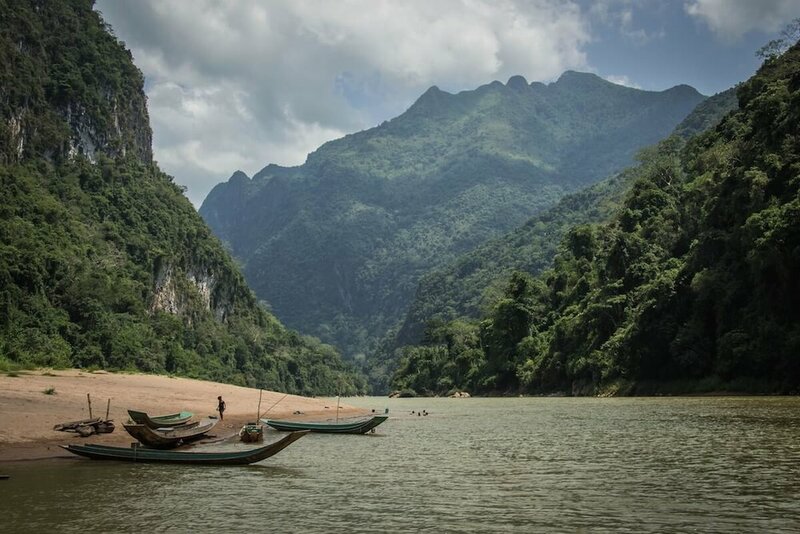 The boat travels through some beautiful areas of the Mekong River, and will allow you extraordinary views of the Laotian jungle, and rural village life along the river. The slow boat is a two day journey. You will travel for about 6 hours the first day, and then you spend the night in the riverside village of Pakbeng. The second day you will travel for about 8 hours to Luang Prabang. It is best to get your slow boat tickets at the docks in Huay Xai (the town just on the Laos side of the Laos/Thailand border), because they are about $10 cheaper than booking them through an agency, and you will also get a good seat for the first day if you book at the dock. Keep in mind that if you are booking your slow boat ticket the morning of departure you should try to get to the docks at 8am when the ticket office opens in order to insure you get a seat for that day. To get from northern Laos to southern Laos we took a plane from Luang Prabang to the southernmost airport of Pakse. Laos Airlines has an office in Luang Prabang and I highly recommend booking your flight in person at this office. Our tickets were nearly $50 cheaper when we booked in person than they would have been through the Laos Airlines website! The office accepts cash or credit cards. The airport in Luang Prabang is small but modern, and very easy to navigate. Still, be sure to arrive at least 90 minutes before your flight, as that is what is recommended by Laos Airlines. There is a small cafe in the airport where you can get coffee, beer, and a light breakfast or lunch. Huay Xai is the first town you reach after crossing the border from northern Thailand into Laos. It is also the gateway to The Gibbon Experience, one of the most unique travel experiences in Southeast Asia. While we did not make it to the Gibbon Experience, two of our close friends did and absolutely loved it! It’s certainly on our list for the next time we’re in Laos. The Gibbon Experience is in the national park just outside the border town of Huay Xai, and visitors get the chance to zipline through the forest canopy, and camp in treehouses! In the morning gibbons call to each other and swing through the forest canopy near the treehouses. After the Gibbon Experience take the slow boat (described above) from Huay Xai to Luang Prabang. Luang Prabang is a small city by Southeast Asian standards, but what it lacks in size it absolutely makes up for in charm. 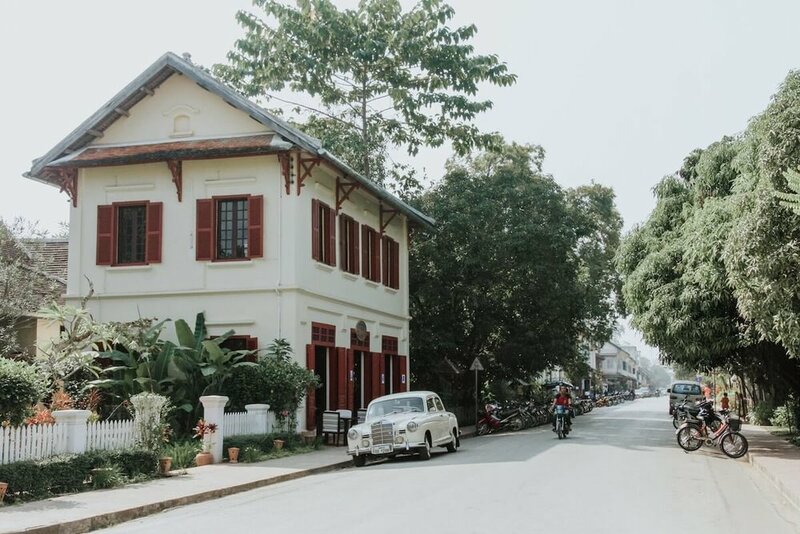 Classified as a UNESCO World Hertiage site, Luang Prabang is a beautiful mix of French Colonial and Asian architecture. There are tons of small and large temples to explore throughout the city, and the courtyards of these temples serve as public seating areas when you need to take a break from all the walking. Speaking of walking- Luang Prabang is an extremely walkable city. We walked everywhere and never needed to rent motorbikes or bicycles (although cycling around the city would also make for a fun day out). Perched right on the shore of the Mekong River, Luang Prabang hosts a variety of riverside cafes, parks, and food stands. 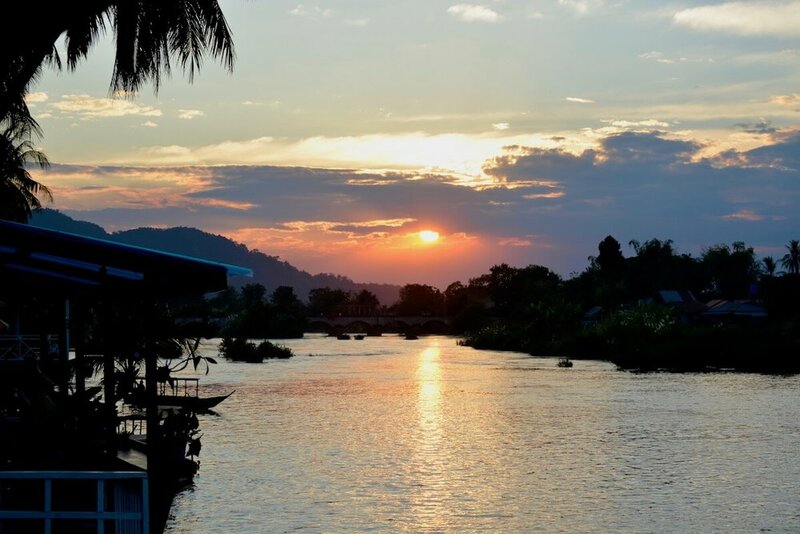 Nearly every evening we walked down to the river to view the spectacular sunsets over the Mekong while sipping a delicious Beer Lao. Luang Prabang is also a family friendly city. There are often fun activities in the town square, and every evening there is a huge night market set up in the center of town. Laotian street food is kid friendly with lots of simple meats on a stick, and sandwiches made to order on french baguettes with as many (or as few) ingredients as you want. One very special family activity in Laos is the Garavek Traditional Storytelling Theater . Traditional Laos stories are told to a small audience accompanied by traditional Laos music. The performance only lasts about 45 minutes, and it is both entertaining and educational. Need help finding a hotel in Luang Prabang? We used Agoda to book hotels all over Laos. Click here to see rooms available in Luang Prabang! Muang Ngoi was my absolute favorite spot in all of Laos. It is harder to travel to than your average backpacking destination, but that’s part of what makes it so special. Muang Ngoi is a small village on the bank of the Nam Ou River, a tributary of the mighty Mekong. To reach Muang Ngoi you must first take a bus from Luang Prabang to the Northern village of Nong Khiaw, and then take a small boat about 90 minutes up the river to Muang Ngoi. The effort in getting there will be richly rewarded by spectacular scenery, true peace and quiet, and some excellent hiking trails that lead to huge caves and tiny villages. We loved Muang Ngoi so much that we wrote an entire guide to help you plan your own visit there! We were very excited to end our Laos travels in the 4000 Islands area of the Mekong. No ordinary islands, this area is where the Mekong River grows so wide that entire islands sit in its center. While we ended up finding a spot here we loved, our 4000 Islands experience got off to a rocky start. Don Det is the most well known tourist island in the 4000 Islands, so we decided to begin our stay there, and then possibly venture to one of the other islands. This was a mistake, and I don’t recommend Don Det for most travelers. When I researched Don Det it was described as a laid-back island with a party scene. Tom and I enjoy a fun party scene, especially when it’s combined with a beach vibe (I mean, we did meet at Burning Man). We also hail from Oregon, so we are no strangers to marijuana, and are firm believers that it should be legal everywhere (though we don’t indulge in foreign countries). For example, we loved Lonely Beach on Koh Chang Island in Thailand, where beach bars played excellent electronic music late into the night, and there was no shortage of fun places to enjoy a good beach drink. However, the “party scene” we encountered at Don Det had a dark side to it that we simply couldn’t overlook. More than a party scene, Don Det seems to be a town harboring an over-abundance of substance abuse problems. Nearly every bar/restaurant we stopped at was being run by extremely altered individuals, many of them permanently settled expats, and many of them locals. Riding our bikes around the island we regularly passed people who were drunk or altered to disturbing extents. At one point a seriously altered expat aggressively and threateningly approached Tom and I out of absolutely nowhere. Luckily, we are chill hippies, and we were able to just walked away from this guy, but the experience rattled us. Later we learned from a local that the bar we had been sitting in was famous for violent bar fights involving the staff and bar patrons! What?! On our second night, early in the evening, a man tore open our bungalow door (apparently we hadn’t latched it well enough), realized we were actually in the bungalow, and began mumbling excuses abut how he mistook the bungalow for his own. We’ll never know for sure, but we both got the feeling he had broken in to steal from us since it was early enough in the evening that most people were still out partying. If you dig into the Tripadvisor reviews for the hotels and bars on Don Det you will actually find a number of stories documenting exactly what Tom and I experienced- lots of drug and alcohol-induced aggressive behavior from the people running the local businesses. I was disappointed that none of the blog posts I read about the area gave any warning about the atmosphere on Don Det. After just 48 hours on Don Det we were so uncomfortable with the dark vibes that we were contemplating leaving the 4000 Islands altogether. Instead, we read about Don Khone, an island just south of Don Det, that had rave reviews for being a relaxing, friendly spot. We decided to give the 4000 Islands one last chance, and we’re so glad we did! We booked an adorable room in Don Khone with a balcony right over the Mekong River where we swung in our hammock, read books, and tried to calm down after our negative experience on Don Det Island (which we now, between us, refer to as Mad Max Island). Don Khone also hosts the beautiful Liphi Waterfall. Liphi is a huge, powerful waterfall on the west coast of Don Khone Island. 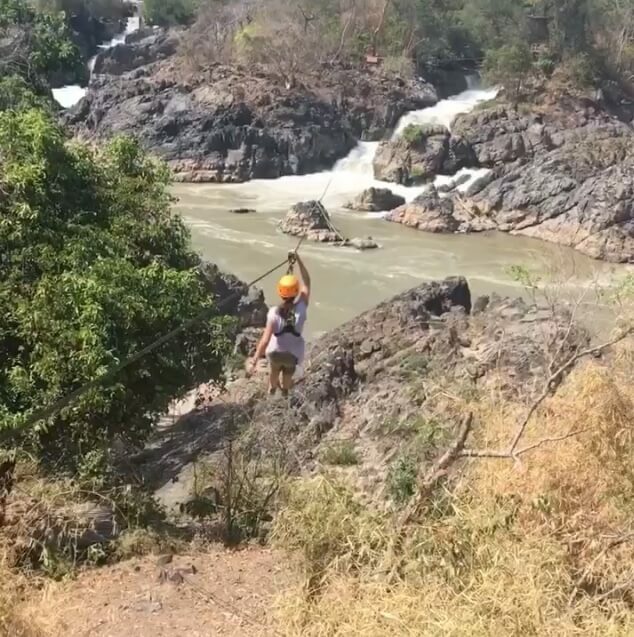 We highly recommend viewing this waterfall the way we did- via zipline! Just over one year ago a series of ziplines were installed over the Li Phi waterfall, and the ziplines allow you incredible, close-up views of the giant waterfall. The equipment was all brand new, and the staff took safety very seriously. We felt safe the whole time, and had a blast flying over the beautiful falls! Along with it’s lovely island vibes, Don Khone also hosts some seriously delicious restaurants. There are a number of places to get a perfect cappuccino, and be sure to splurge on a dinner at Chez Fred et Lea, a restaurant run by a french chef and his Laotian wife. Everything we tried here was delicious, including their pasta carbonara, which was a real treat after 2 months of Thai and Laotian food. Be aware that there are very few spots where you can actually swim at the 4000 Islands. While there are beaches on the map, in the dry season they are almost completely dried up. There is, however, a decent swimming pool at Long Island Guest House, which is just across the bridge from Don Khone Island. It cost 25,000kip (about $3 USD) to use the pool for the day, and there are towels available. This is a great way to spend the hottest hours of the afternoon! Laotian food is delicious, but it’s hard to know what to order without a little guidance. Unfortunately, a lot of the food you will find in Laos restaurants is actually just a copy of Thai food, because that is what many tourists are familiar with. Laos does not have much of a reputation for good food, and I suspect it’s because most people never try Laotian food, but rather stick to the Thai dishes they’re more familiar with. I know it sounds strange, but river weed is super delicious. Seaweed from the Mekong River is pressed with garlic and sesame seeds and then sundried. Once it is dried, restaurants will fry it in a pan and serve it up hot and crispy as an appetizer. We ate river weed everywhere we went in Laos, and it’s one of the foods I will miss most in Southeast Asia! This is a dip made from pureed eggplant, garlic, and chilies. I believe they smoke the eggplant, because every time we ordered it, it had a mouth-watering smokey flavor to it. You eat this dip with sticky rice. In Laos sticky rice comes with most meals, and it is eaten with the hands rather than with chopsticks. To eat jeow mak kua, you make little balls out of the stick rice and use them to scoop up the dip. In Laos, water buffalos are an important part of the diet, and you will see Laotians herding water buffalo all over the country. One of the absolute best ways to eat buffalo is in a traditional Laos BBQ hot pot. This is basically a pot that consists of a round trough that is filled with broth and vegetables. In the center of the pot is a raised grill where you put slices of raw meat. The drippings from the cooking meat go right into the trough full of broth, and it makes an incredible soup. Laos hot pots are served with sticky rice, and are usually enjoyed with a delicious Beer Lao. Laos was also the home of our very favorite local beer in all of Southeast Asia- Beer Lao. Beer Lao is a lager with lots of flavor, and we drank it with dinner every evening. Once we left Laos we found ourselves really missing Beer Lao! We absolutely loved Laos, and are already talking about a return visit! I highly recommend you add Laos to your Southeast Asia backpacking itinerary. Want more information about Laos? 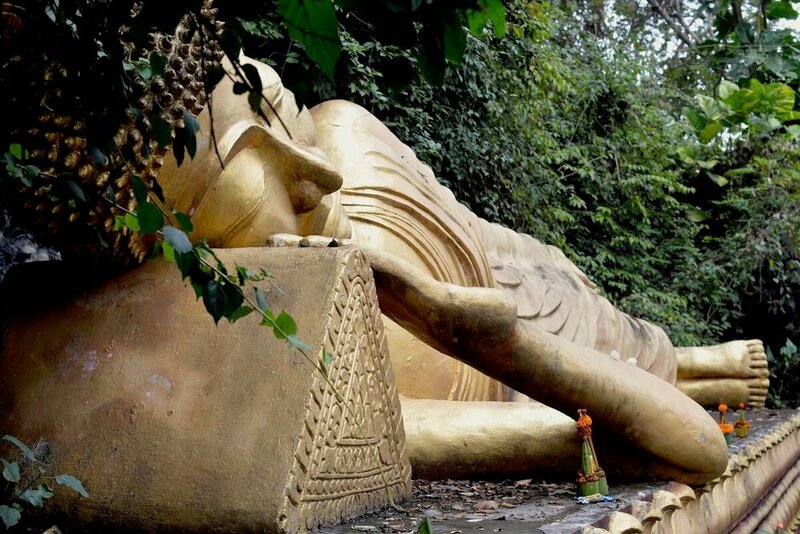 Check out this Lonely Planet Guide to Laos . After Laos we traveled to Cambodia where we explored the incredible temples of Angkor Wat on bicycles! Are you planning a trip to Southeast Asia? Check out our Southeast Asia backpacking route! Not sure what to pack for your trip? Read how we packed for 6 months in a carry on! Trying to decide the must-visit spots in Southeast Asia? Here travel bloggers reveal their favorite Southeast Asia destinations! We also traveled for two years in a camper, and spend our summers attending festivals in the US!